Want to see pictures of Jeeps? Wondering how one model looks different from another? Well, you've come to the right place! Whether you're looking to buy a new or used Jeep or simply want to compare Jeeps to other SUVs --these photos of Jeeps might help you select the one you really want. The Jeep Wrangler has 3 distinctive trim packages: Jeep Wrangler Sport, Jeep Wrangler Sahara, and Jeep Wrangler Rubicon. See which Jeep Wrangler trim package is best for your lifestyle. From the engine, to the interior, and offroad capabilities, we’ll help you choose the right Wrangler model for you. Own A Jeep Wrangler? Then You’re Doing The Jeep Wave, Right? When you own a Jeep Wrangler, every other Jeep Wrangler owner in the world is your friend. No kidding. This camaraderie is identified by something called ‘the Jeep Wave’… or the ‘Jeep Wrangler Wave’. Truthfully, it’s not limited to Jeep Wranglers though… ALL Jeep drivers wave to other Jeep drivers. It’s all in good fun! Here’s how to do the Jeep Wave, the official Jeep Wave rules, and a few other vehicles that have a similar wave. Want a FREE Jeep grille or Jeep Wrangler pumpkin template to carve Jeep pumpkins for Halloween? We’ve got one of each for you + Photos of our Jeep pumpkins. This photo was taken the first time we took our 2004 Jeep Wrangler Unlimited offroad. 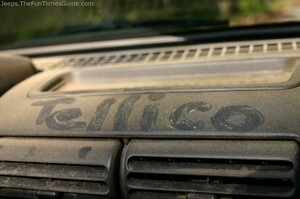 We went to Tellico ORV Area near Murphy, North Carolina and got our Jeep REALLY dirty! Buy a Jeep Wrangler was on my bucket list ever since I could drive. Now that we’ve owned 3, it’s time to add fun places and things to do in a Jeep to that bucket list. Here’s what’s on my Jeep bucket list. What’s on yours? Jeep Dog Days Of Summer: A Fun Photo Contest To Find The Ultimate Jeep Dog! Are you enjoying the “Dog Days of Summer”? Chances are, you and your dog are probably going on a lot of Jeep rides these days. Right? know we are. Our dog loves Jeep rides! Check out this photo contest hosted by All Things Jeep!…There are prizes! Jeepers: Here’s Lookin’ At You! I snapped this photo as we were riding around in our Jeep Wrangler — with the top down. This is us… just motoring on down the road. Here are some modifications and aftermarket items added to a 1990 Jeep Wrangler YJ by our friend, Steve, after he bought this black Jeep from us. Check out the pictures! It’s no secret that Jim & I love Jeep Wranglers. But Wranglers certainly aren’t the only Jeeps worth driving, in our opinion. For most of our married life together, we have owned at least one Jeep. 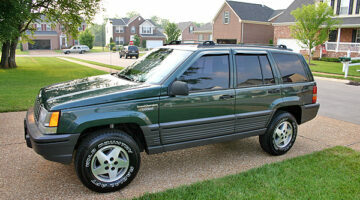 Usually a Wrangler… but there for awhile, the Jeep Grand Cherokee was our vehicle of choice.